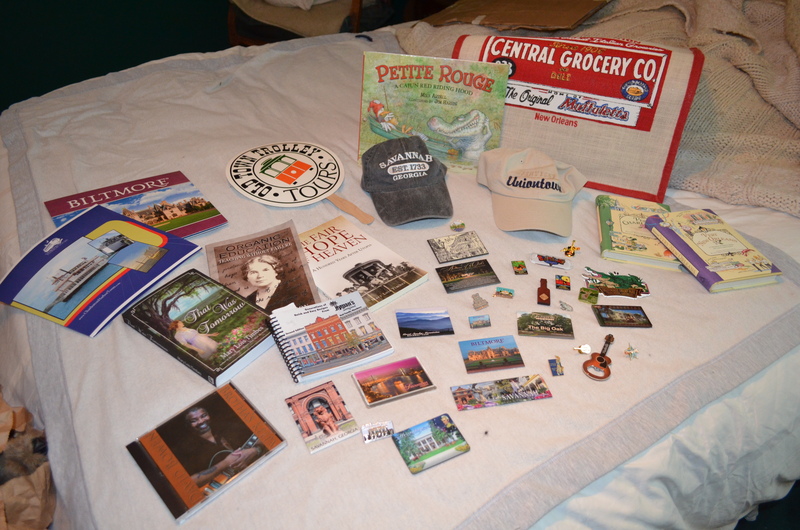 OK – I can’t be the only person who brings home a carload of souvenirs from a road trip…can I? It’s not like I can’t remember the place or person, but I do tend to forget after a time and the things I pick up along the trails of my life make me smile as I walk by them or dust them and shake up a memory from a wonderful experience. My home is packed with such memories and I’m old enough to know I’ll never be a minimalist in any way. 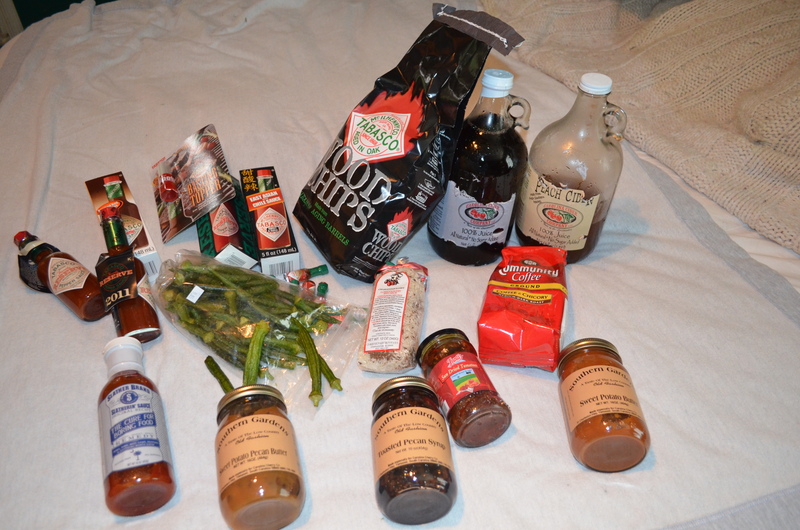 So, here’s what I brought home from my travels through the South this past two weeks…think what you will. 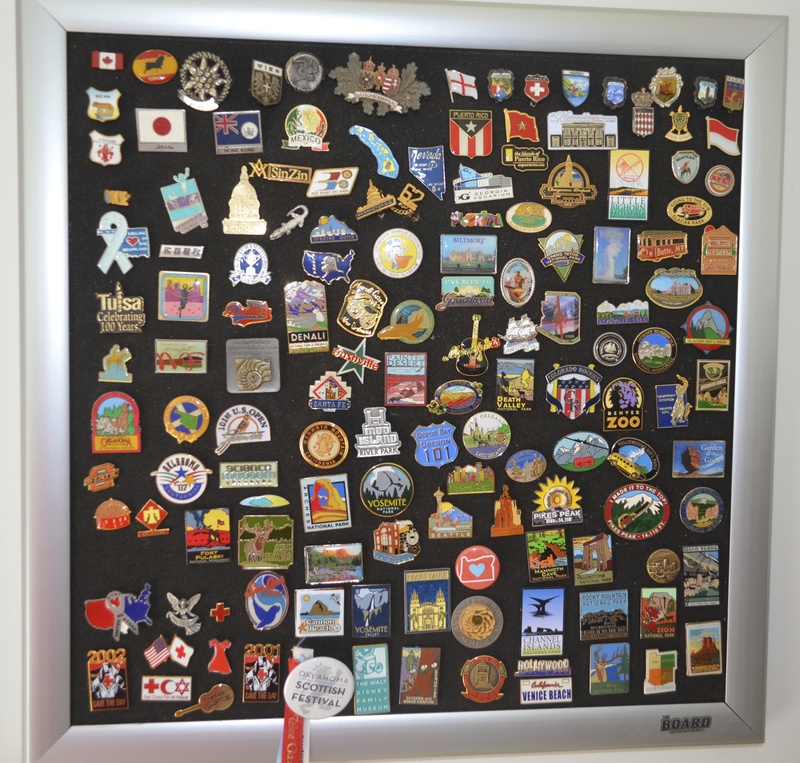 I’ve collected the pins since I was in Vienna way back in the 1970s and saw a man with pins on his hat in European fashion. I used to be somewhat casual about it, but ended up with quite a few and now always look for them. I have them on a little bulletin board in my laundry room that I pass by every day. I just bought a hat and t-shirt in the town where my father was born because that’s all they had. I bought a ball cap in Savannah to wear out on the water and a cute painted t-shirt in Charleston because I liked the artist. After all, I can’t get boiled peanuts and okra chips at home and who could pass up the Peach or Cherry cider and the Sweet Potato anything? And I wanted to see what was in red rice, so I bought a package, and then we went to Avery Island where they make Tabasco sauce and had to buy some of the new flavors. 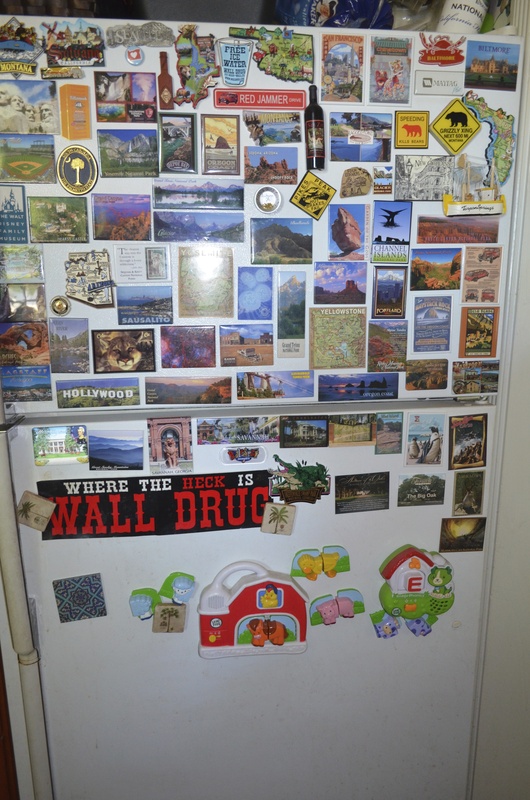 This is nothing compared to the souvenirs that didn’t make it home because they were eaten along the way…another blog. I did buy a cookbook from one restaurant to get the recipe for the best sweet potato soufflé I’ve ever eaten. 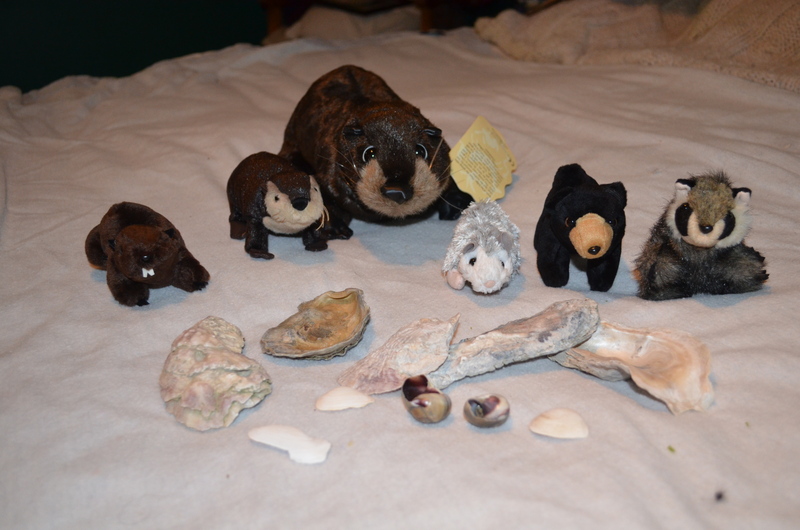 And we had to have things from the nature part of the trip, so I have seashells from the Katrina-wrecked beaches of the Gulf and puppets of animals from the National Parks we visited, Mammoth Cave and the Great Smokey Mountains. Finally, there were the antiques and art I had to have. I’ve always liked to support local artists, especially when they have pieces that represent what I’ve come to love in their home. 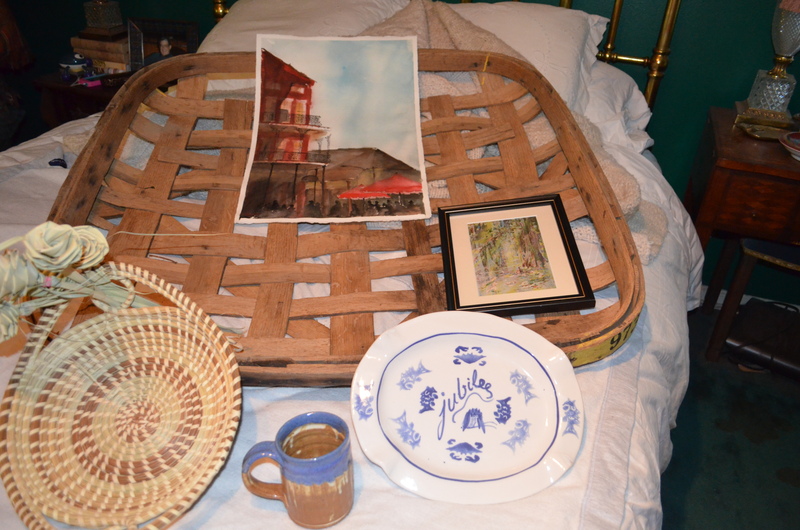 So that is why I came home with a ceramic mug and platter from potters in Fairhope, Alabama, a painting from the streets of the French Quarter in New Orleans, and antique tobacco basket from Thomasville, Georgia (what am I going to do with this huge piece even though I love it and got quite a deal on it) and an antique framed book plate by a well known artist of the Charleston Renaissance period (I learned about that). Each piece of art came with a story to make it even more special.